The thundering roar of a cannon, the gentle hum of cicadas, the soothing crash of the waves on the shore — these are the sounds of the Timucuan Ecological and Historic Preserve. Centered in and around one of the Atlantic Coast's largest urban areas, Jacksonville, the preserve offers glimpses of old Florida. The 46,000-acre respite from the hustle and bustle of life can transport visitors back in time. Here you can wander in the footsteps of the Timucua, the native people of Florida whose shell mounds dot the preserve. In the midst of the city of Jacksonville lay the trails to the past. Passing over a small wooden bridge, the Willie Browne trail leads to the “shell Peninsula,” consisting of mounds of oyster shells left over thousands of years of habitation. The Theodore Roosevelt Area allows hikers to explore maritime hammocks, scrub vegetation, freshwater swamp, and salt marsh. While enjoying the peace and serenity of this stretch of woods, you might overhear the crack of musket fire. The sounds of war rise up from the Fort Caroline National Memorial just down the road . 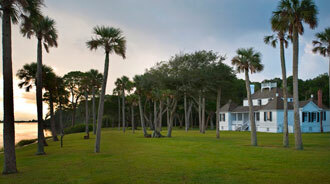 The story of Fort Caroline is sure to regale and excite guests who arrive at the park's main visitor center. Rangers recount the failed French attempt to establish a colony in the New World. Poor leadership, hunger and conflicts with the Spanish led to the destruction of Fort Caroline, but today history is very much alive as crossbow, musket, and cannon demonstrations bellow in the ears of visitors. 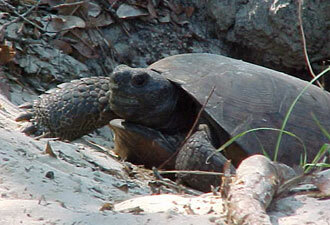 Life moves at a slower pace across the river at Kingsley Plantation. The song of the bunting and breezes through the Spanish moss that hangs from live oaks set a beautiful scene. This beauty is marred by the sad history of enslavement that haunts the cabins along the property's edge. Fort George Island was isolated and reachable only by boat when Zephaniah Kingsley settled here in 1814. He brought with him his wife and three children. His wife, Anna, was from Senegal in West Africa and was purchased as a slave by Kingsley in Havana, Cuba. Later freed, her journey depicts the complicated racial policies of this region as it changed from a Spanish colony to a United States territory. Kingsley Plantation also boasts the oldest still-standing plantation house in the state of Florida; the house is available for tours on the weekends, just don't forget to make a reservation. 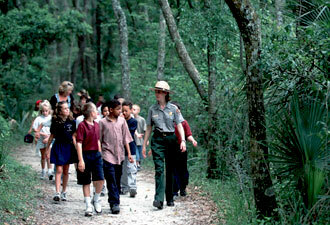 The Timucuan Preserve encompasses 6,000 years of human history. From the archaic shell ring builders to modern day anglers and boaters, the preserve links people to this estuary. This rich coastal environment encouraged settlements throughout the years; it remains an attractive spot today. So, as your car winds down the scenic A1A highway, roll down the windows and listen to the noise of civilization fade away as the sounds and waters of the Timucuan Preserve rise up to meet you.